With regard to wasp nest treatment, it is always advisable to contact the experts. Wasps can be extremely aggressive and therefore will attack without much provocation. Many have tried in the past to remove a nest by setting fire to it, dousing with water or even using a baseball bat. All of these methods can be both dangerous especially as wasp nests are made of chewed wood. The chewed wood forms a thin papery type substance which is highly flammable. Setting this alight can often mean damage to property. Dousing with water or using a baseball bat does not kill the wasps and therefore the risk of being stung by a swarm is highly likely. For those suffering, as a result, anaphylactic shock, the outcome could be deadly. 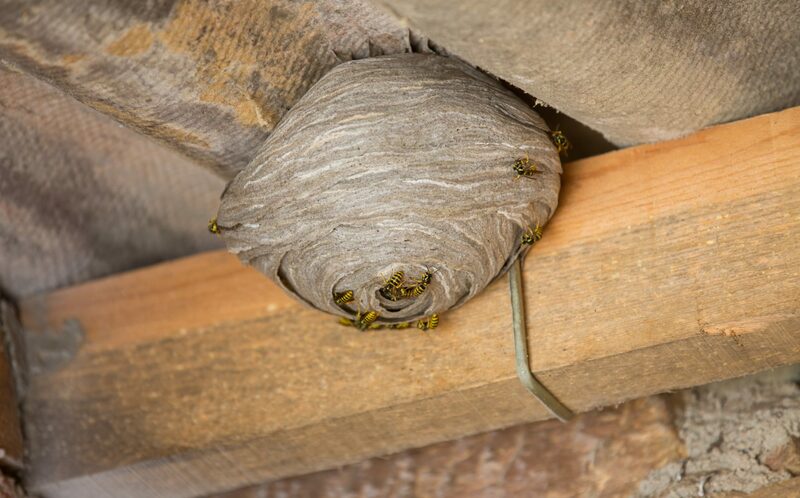 Our pest prevention Technicians are experts in the removal of wasp nests. Thoroughly trained, with appropriate clothing and possession of the right equipment, ensures safe removal of the wasp nest. Problem with Wasp Nest Treatment?